This story keeps on deepening. (If you haven’t followed the story read through the link at the bottom of this article) The latest is a response from a guy whose brother happened to look like the kid from the Catholic school. His name was put on social media and as a result his family and his family’s business have been subject to non-stop attacks. Threats of physical attack, slander of the family and the family business in an attempt (perhaps successful) of destroying a family because a member of the family was inaccurately identified as the student in the video. This family has no connection at all to the events on the video but their lives are threatened. 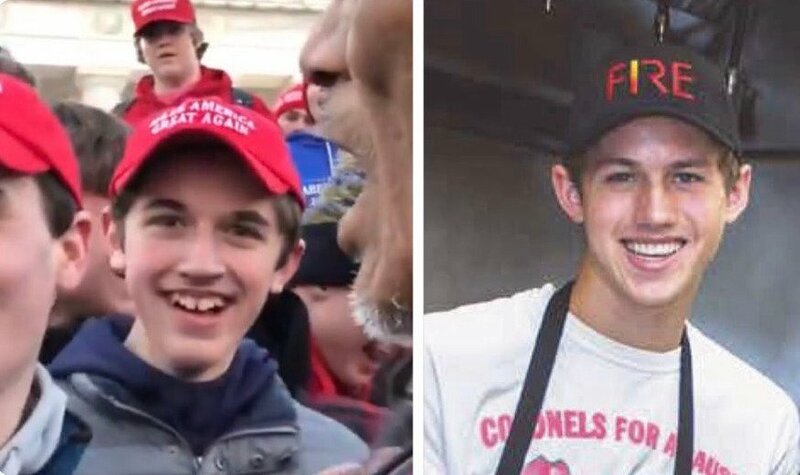 This is the “reasoned” response to a young man smiling oddly and remaining in an individual’s personal space after his own had been invaded. I “know” the smile radiated “evil” of the darkest kind – but even if you interpret the smile in that way the reaction has been far more evil. Social and instant media can create this kind of mob think – where we act (at least for most of us I hope) against what we would otherwise know to be an unwise, ill-considered course of action. All of us (myself included) would be wise to not take the click bait. No matter which news source you prefer there is almost always a slant – a bias – driving it. We can do better on both sides of the aisle at not just looking for confirmation of our biases. In the case in question if you hate Trump the MAGA hats make you look at the situation in a certain light. They same thing happens the other way. Instead of further pushing us apart as a people this could be an event to draw us together. Perhaps we will be not so quick to judge – not so quick to demand retributation. We could admit that we are all at times wrong in our judgement or rash in our response and we could extend grace to each other. Not just when our judgement is in error but grace even in the face of actual wrong. If we are honest with ourselves – and if all that we have ever thought or done was broadcast on twitter for the world to see and judge we would all be found guilty. I know I would be. Jesus’ message to the world is -yes you are guilty – more than you probably recognize or want to admit – and when compared to God we all stand guilty and worthy of death and hell. But God has another word – it is called the Gospel – Good News – and that is the perfect One – our creator became a part of his creation to redeem us. He died the death we deserve to rescue us – to restore us to his good design for humanity. So yes more guilty that I dare admit AND more loved that I thought possible. When I am honest about who I am and when I see that despite who I am God has loved me, forgiven me and adopted me as his child – I am freed by His grace to extend grace to others with whom I disagree or who even hate me. If there is to be a change in this country – a reconcillation – it will come with the rediscovery of this Good News – that though grossly undeserving God has forgiven and received me. If we were to fall on our faces as a country and acknowledge our sin we would begin to recognize the sweet notes of the Good News that Christ has come for sinners. And if that were to soak into our national conscience and we believed it to be true our country I believe would experience a new birth of freedom.